The last two weeks of 2012 for me have been a mixture of great times and a little challenging too. Months prior to December, I made plans to spend Christmas and New Year’s Eve in Atlanta, GA. It was a trip of both business and pleasure. Christmas Eve brought an unwelcoming surprise. My father was experiencing severe abdominal pains. Now for anybody who knows my Dad, he has never been a sickly man and not one to complain about anything…even pain. But when he came to me and said he was in a lot of pain, I immediately put on my clothes and drove him to the emergency room. We were both confident that it was probably something minor like gas or whatever, but that emergency room visit turned into a night observation. I stayed with my Dad and wishing I could take the pain away. I wanted to cancel my plans to go to Atlanta and I would have…if it was just a pleasure trip, but it wasn’t. I really needed to get some business handled that could not be postponed any longer. I tried to move my flight to a later flight, but Spirit Airlines and those ridiculous fees would have left me penniless. So I prayed and asked God to take care of my Daddy. I trusted Him, left my Dad, went home to gather my things and headed to the airport. When I came back home on New Year’s Day, I went home and rested a little and then got up to go see my Dad anticipating that he would possibly be released, but when I saw him my heart sank. He had all kinds of tubes coming out of his body and the one tube we both hate the most is the NG tube (very painful going in and coming out). When i walked in I greeted him with my big smile and stepped out for a moment to cry. I felt so helpless. One of my friends, Byron, sent me a text at that moment and said, “This is God’s problem to handle. Give it to Him. Pray and have faith that He will do what’s best. Period. Have worship and Praise God for His goodness. I’m not joking.” So I wiped my face and I did exactly what he said. I went back into the room with my Dad, I praised God, sang and worshipped. I promise you…after that…my faith took off into beast mode! My Dad ended up having 3 surgeries in the span of 4 days. He went through a lot, but I made sure everytime he saw me, he saw my smile. Every time he heard my voice, there was joy in it. Every time I whispered in his ear, it was a reminder of who was in charge…our Almighty God. The night of January 8th, I was experiencing some severe abdominal pain. A pain that was all too familiar from my past. I’ve had intestinal issues since I was an infant and have had 3 major surgeries in my 40 years of living…all because of my tricky intestines. 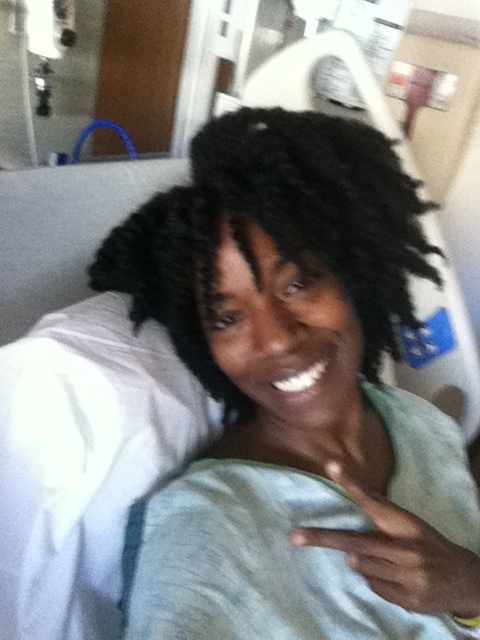 I got scared because I knew the pain all too well and in my mind that meant more surgery which I just had 3 years prior for the same thing…my intestines/bowel obstruction. The pain was too much for me so I called my brother Steve to come get me. We tried some alternative procedures, but the pain was not letting up so we got in the car and headed to emergency…a different hospital from my Dad though. Here’s what was crazy…Broward General Hospital (ironically where I was born) is ALWAYS packed in the emergency room. But there was only 2 people in there. I was registered and was seen less than 10 minutes. Unheard of…trust me. One nurse attendant came to treat me asked us, “How do you guys get through so quickly?” We told him there were only 3 people in the emgergency room. He said, “Are you sure??? There were tons of people in there. It has been a crazy busy night for us!” Brother and I just looked at each other and shrugged our shoulders. They took a catscan and when the tests came back…sure enough it was my intestines again. I broke down in tears because I didn’t want to be cut open again and I DIDN’T WANT THAT DREADED NG TUBE IN MY NOSE AND DOWN MY THROAT! IT. IS. PAINFUL! After I came to grips with what was going to happen with the tube, I took my brother’s hand and my faith went into beast mode again. They admitted me and God has been handling EVERYTHING since. I’m still in the hospital right now. They found some other stuff for Him to take care, but I’m not worried…I haven’t been really. God worked it out so that I didn’t need to have surgery again. You see, my intestines were twisted and inflammation was everywhere, but GOD! LOLOL!!! The doctor said the inflammation went down and my intestines untwisted itself. Ha!!! They were also concerned about my kidneys because they found a huge fibroid. I can actually feel that fibroid as I’m typing this blog. Tests came back and the doctor said my kidneys are doing just fine, but they wanna keep an eye on me concerning the largeness of the fibroid so it won’t cause damage to my kidneys. I am not worried about a doggone thing. I know my God will take care of that fibroid too. I’m happy that all of this happened…even the things going on with my Dad because I was taken to a place of faith where I can say I’ve never been before. It took me to a place of trust in God that I have never been before. Don’t get me wrong…the pain I experienced sucked and seeing my father in that hospital bed had my head spinning, but once I locked my mind and heart into the assurance that God was handling EVERYTHING…I was good. I am good. Daddy is good. I don’t know who’s reading this. You maybe someone who is not a believer in God or this might be a boost for a believer in God. I can’t force you to take what I’m saying is truth or fact or whatever…I just know that God is amazing and whatever He decides to do from here on in even if I don’t understand it right away…He has shown me in so many ways that I can trust him with my life and the life of those I love the most. Whether you are a believe or not…I hope this encourages you. Peace and blessings! Hey Tash!!! First of all, I’m glad you and your dad are good! So happy to read you again! And second, I do believe in God, but reading your words is definitely encouraging. One of my resolutions for this year is exactly that. To believe and surrender to God’s plans. Even if I don’t understand them. I know I’ll be just fine! I hope you get better! Let me know if you need anything! Girl, I read it and I am encouraged!! God’s got your back . . .and your front, below, and above. You’re surrounded! !